It’s never easy to apologize, especially when you’ve angered the very people you count on for your livelihood. The National Hockey League, specifically its owners, potentially reversed seven years of increasing goodwill and fan excitement when it locked out its players in an attempt to force the players’ union to accept an odious Collective Bargaining Agreement. The players (rightfully) dug in and, on January 12, the two sides ratified an agreement and 48-game schedule they could have reached months ago. So how do you make up for three months of no hockey and a loss of 34 games per team? One good place to start is by putting your money where your mouth is. The dispute was about money, so that’s the currency you use to apologize to your fans. 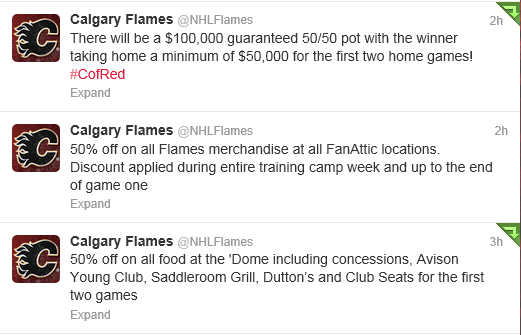 For the first two home games this year, you can get a beer spilled on you at the Saddledome for half price, buy Flames gear for 50% off until the end of the first game, and have a guaranteed win of C$50,000 (with another C$50,000 going to charity) for the 50/50 drawings at the first two games. That’ll go a long way toward regaining their fans’ support. Apology accepted, but this is the third time we’ve missed games during Gary Bettman’s tenure. Don’t let it happen again.